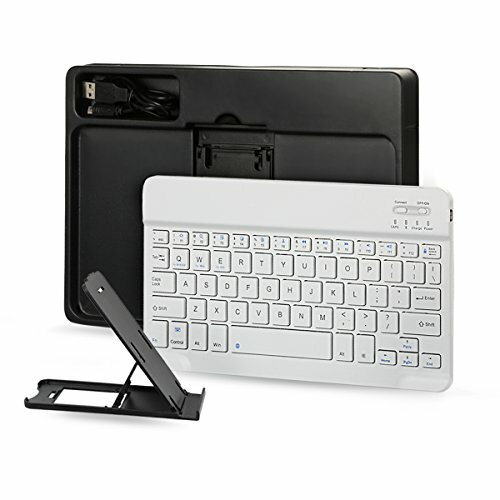 Compatible - Support IOS, Android and Windows system, this Bluetooth wireless keyboard workable for most of tablets and smart phones like iPhone, iPad 2018 2017, iPad Pro, iPad 2/3/4, iPad Air, Samsung Galaxy Tab A,GALAXY Note, Nexus 10, LG, Nexus, Huawei, ZTE etc. Portable - You could carry the keyboard and holder anywhere you go for trip, travel, meeting and stand your tablet/phone anytime anywhere. Bluetooth Keyboard - Real "hard" laptop style keyboard with high quality ABS material. Not cheap silicone keyboard as other cases in market, which helps you to type faster and with less error than on a touchscreen. Long Battery Life - Built-in rechargeable lithium battery provides for 140 hours of uninterrupted usage, while auto-sleep feature saves power and ensures you get the most out of every charge. Portable and Lightweight - 9.3"L x 5.2"W x 0.2"H (235mm*135mm*5mm). Less than 1/4 inch and small enough to put it into your suitcase/handbag. If you have any questions about this product by Feelkaus, contact us by completing and submitting the form below. If you are looking for a specif part number, please include it with your message.